The Utica OD reported that an oversight by the former executive director of the Community Food Bank of Greater Utica may end up costing the local nonprofit thousands of dollars in taxes from which it would normally be exempt. Mark Wolber, president of the food bank’s board of directors, told city Common Council members Wednesday that Kim Strong, who resigned as executive director for personal reasons in October, failed to file the proper paperwork for tax exemption status after the organization purchased its current building at 112-114 Bleecker Street several years ago. The typically tax-exempt 501(c)3 organization now owes the city $10,000 in back taxes as a result. Read more here. This popular workshop is an excellent way for program staff, administrators, and boards of directors to gain a general understanding of what grants are all about and the elements required for success. Equal attention is given to the needs and interests of both your organization and grantmakers. Participants receive Word and Excel templates to help them develop grant proposals. Instructor: Nonprofit Works President, Paul Mastrodonato, has helped nonprofits obtain funding from foundations, corporations, and government agencies for over 18 years. Paul’s presentation style is known for being informative, interactive, relaxed, and fun. 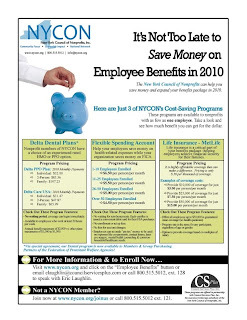 or visit our website at www.nonprofitworks.com. The Utica OD reported that the Community Foundation of Herkimer and Oneida Counties received its largest donation ever on Monday — nearly $6 million. The funds — which came from the Mele Foundation after it dissolved and sold its assets — will be used to establish the Mele Family Fund, a donor-advisory fund that will be awarded to area nonprofits, said Anne White, director of marketing and communications for the Community Foundation. The Community Foundation typically receives about $2 million to $4 million per year in donations, but the last three years have been “extraordinary” – with a total of $23 million, said Peggy O’Shea, president and chief executive officer of the Community Foundation. Mele Companies first was established by Emedio Mele in 1912 in New York City and moved to Utica in the mid 1950s. The jewelry box maker once was one of the area's major employers. Read more here. The Gouverneur Times reported that State Sen. Darrel J. Aubertine and SUNY Canton yesterday launched the North Country Grant Search Web site, a working database of public and private grants designed to provide broad access to available funding for nonprofits, municipalities and economic developers. “This new Web site is a new and powerful tool for local governments and nonprofits,” Sen. Aubertine said. “Now more than ever our Central and Northern New York municipalities and nonprofits need the best tools at their disposal to take advantage of whatever state, federal and private funding is available. This site is a one-stop shop bringing together on one site the contact information for hundreds of foundations and agencies. The work SUNY Canton has done to make this site easy to use and accessible will go a long way toward ensuring that key projects and initiatives in our region have the funding they need to move forward.” Read more here. is coming to Oriskany, NY, February 8-12, 2010. Cornell Cooperative Extension of Oneida County. During the workshop, participants learn The Grantsmanship Center's proposal-writing format, the most widely used in the world. In addition to practicing advanced techniques for pursuing government, foundation, and corporate grants, participants work in small teams to develop and then review real grant proposals. Participants exit the class equipped with new skills, new professional connections, and follow-up services for one year, including professional proposal review, access to The Grantsmanship Center's exclusive online funding databases, and an array of other benefits. Many also leave with proposals that are ready to polish and submit. To ensure personalized attention, class size is limited to 30 participants. To register online, click here. For more information or to learn about scholarship opportunities for qualifying organizations, call The Grantsmanship Center at (800) 421-9512.
geographic areas and jurisdictional levels. Each year, Genesis brings together our areas Elected Officials to focus on the issues facing our region and to discuss their goals for the new year. Kuyahoora Valley, Marcy, New Hartford, Rome and Trenton. 2000 by a group of community leaders who believed it was time to transform the Mohawk Valley into a vital region where positive economic, social and quality of life changes are possible. Today, The Genesis Group is a vibrant association working to advance regional economic, social and cultural interest and to foster regional unity and cooperation. The Oneida and Herkimer Nonprofit Executive Directors Group has changed its name to Mohawk Valley Nonprofit Leaders Group. Sponsored by The Community Foundation of Herkimer and Oneida Counties, Inc.
* Consumers and business confidence rebounds. * The economy begins to see job growth. * Small businesses have better access to credit markets. * Key economic indicators in housing and construction, finance and the automobile industry improve. * Sustainable markets can be developed or induced for green technology jobs. While the Mohawk Valley has escaped the worst of the economic downturn, our economic prospects depend on how well state government adjusts to new economic realities. State budget and regulatory policies are “out of line” with the new economic realities that have Wall Street being a smaller part of the state’s economy and takes into account structural changes in the state economy. New York has a rich supply of low-cost hydropower, but this energy resource is not used to maximize economic growth in upstate. Part of this cheap power resource is committed for lower value uses not related to attracting or retaining economic activity in upstate or is legislatively restricted to specific areas of the state and not available elsewhere in upstate. Without fundamental changes in tax, regulatory and energy policy, New York’s economy – particularly in upstate — will continue to struggle and the upstate region will more closely resemble that of Eastern Europe before the end of the Cold War. A global marketing effort is under way to position the Mohawk Valley region for expansion opportunities by the semiconductor industry, advanced electronics, photovoltaic manufacturing and emerging clean tech sectors. EDGE, SUNY, SUNYIT and the Research Foundation of the State University of New York have forged a partnership to develop the 300-acre site at SUNYIT that will build off of New York’s successes to be a global hub in semiconductor manufacturing and nanotechnology. A Project Development Agreement is being finalized that will provide EDGE with a ground lease on the 300-plus acre site and $25.6 million in state and local funds are earmarked for infrastructure, site and other improvements commencing in 2010. In addition, the College of Nanoscale Science and Engineering and SUNYIT have entered into a unique cross-university partnership that links both colleges together under a $45.0 million R&D-commercialization initiative in chip design and integration that will be part of SUNYIT’s new Center for Advanced Technology and will complement efforts to market the Marcy site to a global industry. Griffiss continues to achieve national recognition for its success in transforming a former military installation into a model for regional economic development. Approximately $405 million in public and private investment has occurred at Griffiss since 1995. More than 5,500 people are employed by 70 private and public employers at Griffiss. There is also a growing cluster of software development and information technology companies co-located next to the Air Force Research Laboratory. Technology companies such as CUBRC, BAE, Alion, AIS and CACI expanded or commenced operations at Griffiss this year. The research laboratory is also undergoing changes with the expansion of new and renovation to key laboratories and technology facilities. Working closely with Oneida County and businesses at the Oneida County Business Park, EDGE spearheaded a redevelopment plan for the former Oneida County Airport. The reuse plan identifies key infrastructure improvements to support immediate and longer-term requirements to program nearly 2,600 acres for economic development and complements EDGE efforts at Marcy NanoCenter and Griffiss Business and Technology Park for marketing of this location. EDGE is working closely with Rome Industrial Development Corp., Rome Community Brownfield Restoration Corp. and the city of Rome on two key economic development initiatives: * Led to the construction of a 60,000-square-foot manufacturing-distribution center by American Alloy Steel on the former General Cable site. * Continue the redevelopment of the former Rome Cable facility by completing environmental remediation activities and demolishing obsolete buildings to create new development sites. Business outreach and assistance efforts: A core part of EDGE’s mission is to work with existing employers on expansion and business retention issues. Over the past year, EDGE and its partners helped ECR International consolidate operations in Utica, assisted F.X. Matt Brewing Co. on rebuilding its canning and warehouse operations that were damaged by fire and approved financing for Delta Hardwoods. Business and community advocacy: EDGE has played a key role in being a strong advocate for areas business needs and has spearheaded efforts on key regional issues. This year marked a landmark victory for the eight counties that would have been impacted by the NYRI power line. EDGE played a leadership role in working with the impacted counties and Communities Against Regional Interconnect, which was formed to oppose this effort. A comprehensive economic development agenda for the Mohawk Valley that focuses on innovation, technology and education is in place. However, significant changes in tax, regulatory and energy policy are required in Albany if the Mohawk Valley and upstate are to attract private investment and be a beacon of opportunity for new business expansion and attraction opportunities. This Community Forum will provide a valuable opportunity for officials to hear the thoughts and concerns from a variety of geographic areas and jurisdictional levels. Participating in the forum are officials from federal, state, county and local levels of government. The Chamber Alliance of the Mohawk Valley includes the chambers of Boonville, Camden, Clinton, Herkimer County, Kuyahoora Valley, Marcy, New Hartford, Rome and Trenton.